A CELTIC fan who asked for a ‘Ten In a Row’ tattoo in Magaluf discovered in the morning something had been lost in translation. Robbie Brunton, 25, from Fife, asked for the ink in anticipation of his team’s securing ten Scottish league titles on the bounce. 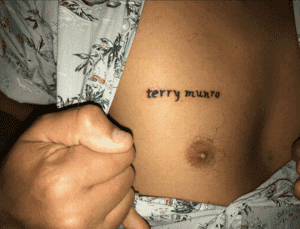 But the boozed-up supporter soon discovered his broad Scottish accent had confused matters, with the name Terry Munro now forever branded on his chest. “To be honest I can’t really remember getting it done,” he said. “I was pretty drunk. I think we’d just went to the tattoo place after a night out about 6am. “I just remember waking up in the morning and wondering why I had it on my chest. Brunton got the tattoo done in May and had managed to keep it secret until someone took a photo of it which went viral on Twitter.